ATLANTA – Jan 2, 2007 – IDology Inc., a leading provider of electronic age and identity verification solutions, today announced that it has published a whitepaper designed to examine electronic age verification solutions and how using this technology helps protect children online. “Doing the Right Thing: How Electronic Age Verification Protects Children Online” tackles the complicated subject of age verification and the risks businesses face by not using an age and identity verification solution. Age verification has been a recent subject of concern due to the heightened exposure of issues surrounding social networking. 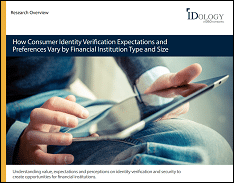 This paper reviews the emerging trends in the age and identity verification market and examines the benefits of integrating an electronic age verification solution within a business. It also offers a complete set of factors to consider when evaluating age and identity verification providers. IDology, Inc. (www.idology.com) provides real-time technology solutions that verify an individual’s age and identity while maintaining consumer privacy and building trust through the responsible use of data. Our proprietary product ExpectID(tm) validates individuals using as little information as name and address. And our industry leading ExpectID Age confirms someone’s age in customer not present environments. Through our patent-pending process and advanced technology engine, businesses can enable knowledge-based authentication to verify customers without alienating them or being labor intensive on their business. IDology helps its customers drive revenue, reduce costs and prevent fraud. For more information contact info@IDology.com.